It’s been rainy and windy and warm all at the same time tonight after a hot weekend. I’m glad my garden will be getting watered and happy that the wind will blow away the mosquitos. Over at Rambling in the Garden it’s been snowing and Cathy has lovely simple Paper Whites with Dogwood and twisty Hazel in a beautiful Caithness glass vase. 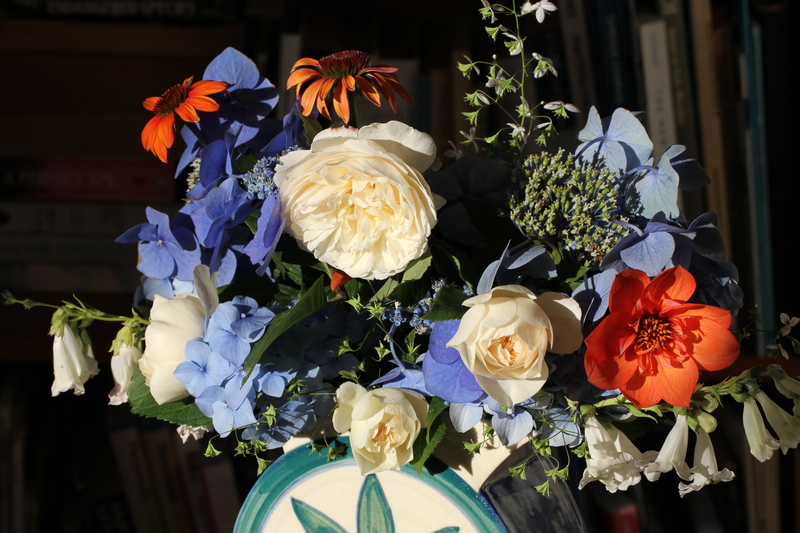 Hydrangeas Blaumeise and an unknown, with Rose Lichfield Angel, a dark leaved Dahlia, white Penstemons, and I think a small Echinacea flower. I’m not very familiar with most perennials which die down in winter – by the time they come up I have forgotten what they are. My Dahlia vase features the Tip Dahlia, found as a big lump at the local rubbish dump and now multiplied many times. It’s a deep red burgundy, incredibly strong and bold, turning purplish as it ages. The others are Eveline, white shading to mauve, covered with many flowers for weeks now, and the red with white tips which were part of a cactus mixed bag, all very big and strong. Iceberg roses add scent and Thalictrum which is almost finished, Hollyhocks, and Salvia are in there as well. Salvia ‘Wendy’s Wish’ is the dark burgundy flower, and there is a single bud of a large leaf Salvia. With the Sweet Peas I have some blue(mauve) Scabiosa and a pink Salvia. Scrumptious! have a wonderful time with your Mum! I like the muted blue of the hydrangea with that pop of orange. I think it is echinacea too. Lovely. What lovely arrangements – a really super floral welcome for your mum. Enjoy her visit. 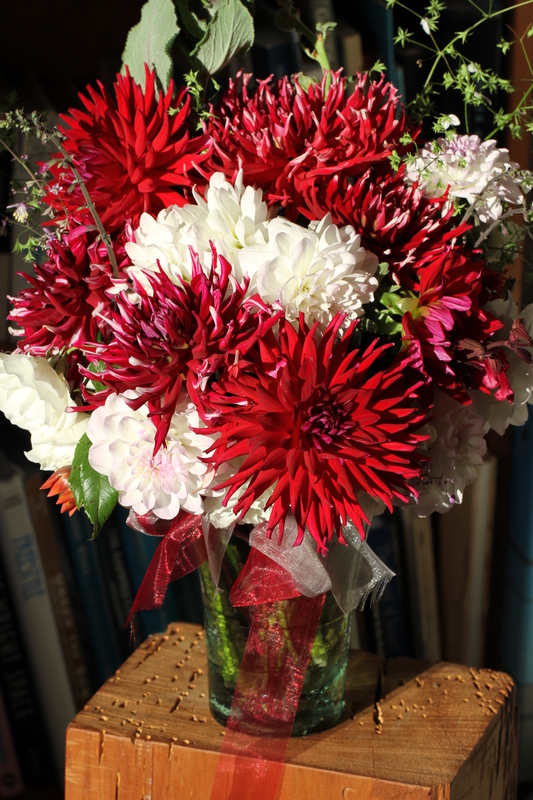 Oh what a bounty of flowers…you are blessed and your mom will love them! Thank you Donna, I hope she will. Oh, my, these are stupendous, Cath! 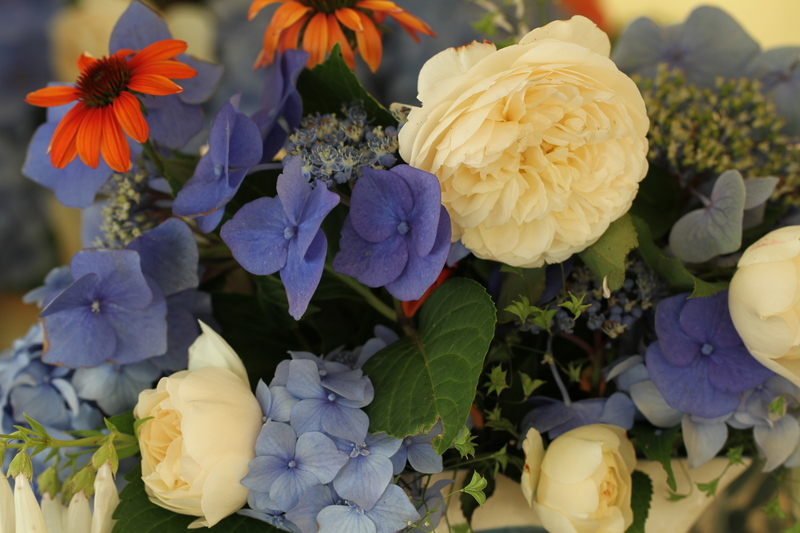 I can imagine the sweet peas smell divine and love the boldness of the red and white dahlias, but my favorite is the delicate blue hydrangea with the soft roses and just a touch of orange for contrast. Simply wonderful! Thank you Eliza, I like that one best too. They all have a nice scent but the blue is a little cooler and more relaxing. The roses and hydrangeas are so lovely and demure, with the orange color accents, but the dahlias are such a wild explosion of gorgeous colors! Fantastic summer flowers, Cath, for us poor winter folk. Thanks Hannah! You have got the promise of Spring. 🙂 Although I know that last bit before Spring can seem to drag on. If you keep showing us your gorgeous Lichfield Angel I can see it going on my wish list – it really is a beautiful rose! Three lovely vases but I think the first one is my favourite – I wonder which your Mum will like best? Enjoy her visit – how often do you get to see her? 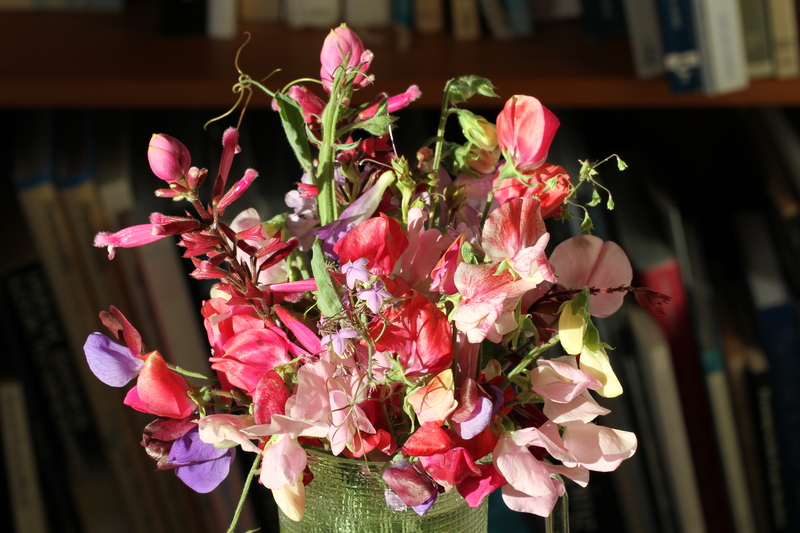 Thanks for sharing all your varied blooms – such a great selection, and a great find at the tip too! It is lovely to see how many flowers you have while we in the the northern hemisphere are searching for single blooms. Your hydrangea is a really intense blue, I’m not surprised you could resist picking it, next to the orange it positively sings! Thanks too for recognising the stem in my vase this week. Enjoy your time with your mum.